The premise of the puzzle platforming game Gunpoint is utterly ridiculous. Through mail order, you receive “BULLFROG brand hypertrousers” that make you jump far and high, and fall from any height without taking damage. You are Richard Conway, Freelance Spy, and with your special new pants you will solve your biggest case ever. Now, special pants are not the entirety of the story. Someone has been murdered, and since Conway was the last one seen in the building, it is up to him to solve the murder. The story is equal parts noir detective story and hilarious fourth wall breaking dialog, backed up with a jazzy soundtrack that suits the mood perfectly, and while there are not many tracks, the game’s short length and the strength of the music keeps it from ever becoming tired. 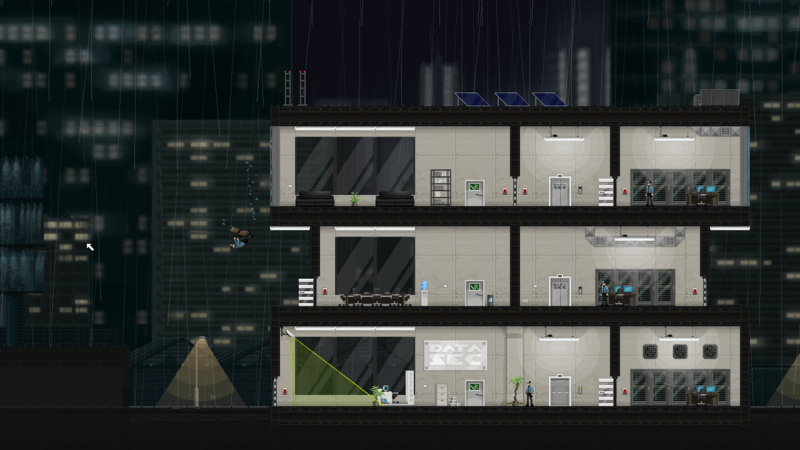 Artistically, the style fits the setting with clean offices, dirty apartments, and a simple, blocky style. The art supports the mechanics; Gunpoint looks retro, and the gameplay feels like it could have been a classic arcade game, with just enough new stuff to feel fresh. Gameplay in Gunpoint is simple but deep. Hold the left mouse button to charge up a jump, and an indicator will appear on screen showing the arc your jump will take. You can attach to walls and ceilings to crawl around, launch yourself through windows in or out, and quickly move out of sight of guards. Or, if you choose the more direct route, you can use your pants to pounce on guards. These guards can be punched once to knock them out, or you can go on a violent rampage and punch them until they die. There is an element of risk, however, as a single bullet can kill and guards are deadly accurate even from long distances. Punching guards is not the only way to remove them from your path, though. You can tackle them to shove them out a window, trick another guard into shooting them for you, or set up a trap for them. The traps come about via Gunpoint‘s second major gameplay element, the Crosslink. This gadget lets Conway link various electronic devices together. So, normally a light switch may turn off a light, and you can use that to get a guard to come investigate luring him into a simple trap. Or perhaps a security camera that is linked to an alarm is in your way – rewire it to open a nearby door instead. Your rewiring and trapmaking can be as simple or as complex as you want. One setup I made had me turning off a light, getting a guard to investigate a nearby light switch. When he flipped it, it sent an elevator to another floor, drawing the attention of another guard and leaving me an opening to slip past. There are simple tutorials that teach the basics of the Crosslink, but it is up to the player to decide how complex to make their traps. Later in the game, upgrades allow the Crosslink greater flexibility, even creating the possibility of linking light switches to a guard’s firearm. Depending on your setup, the switch can cause the gun to fire, or the gun could cause a light to turn off. These upgrades are smartly designed, and there is no consequence to selecting one. In between each mission a store allows the player to buy an upgrade, and the player can jump into a test level to try the upgrade immediately. At any time after that the upgrade can be sold back for the same amount that it was purchased for. Once upgrades are selected the player selects their next mission, which is introduced through a discussion with the contractor. 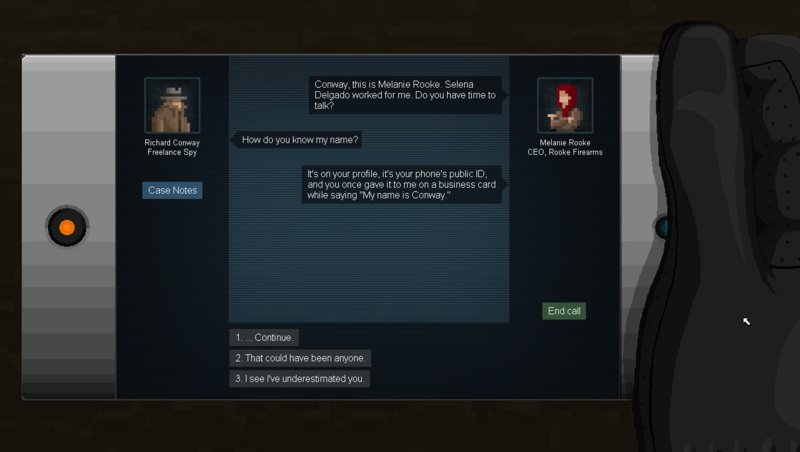 The player can choose different responses during the conversation, but there is very little branching. For the most part, these decisions just vary the tone of the conversation from relatively straight laced to hilarious, and there is no risk of missing any portion of the game. At a little over three hours for a playthrough Gunpoint is short, but satisfying. It is unfortunate that the upgrades really begin to mesh well right as the game ends, making me wish there had been a couple more missions added on. Still, earlier levels can be replayed with all the upgrades earned for higher grades, and the included level editor will hopefully encourage others from adding significant value to the game. 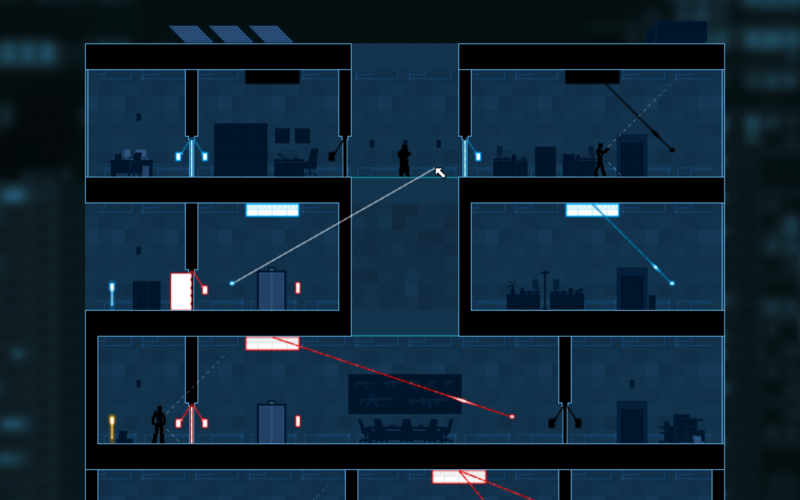 For ten dollars Gunpoint offers a silly amount of fun, and comes highly recommended.